Chinese Chicken Salad - Made It. Ate It. Loved It. 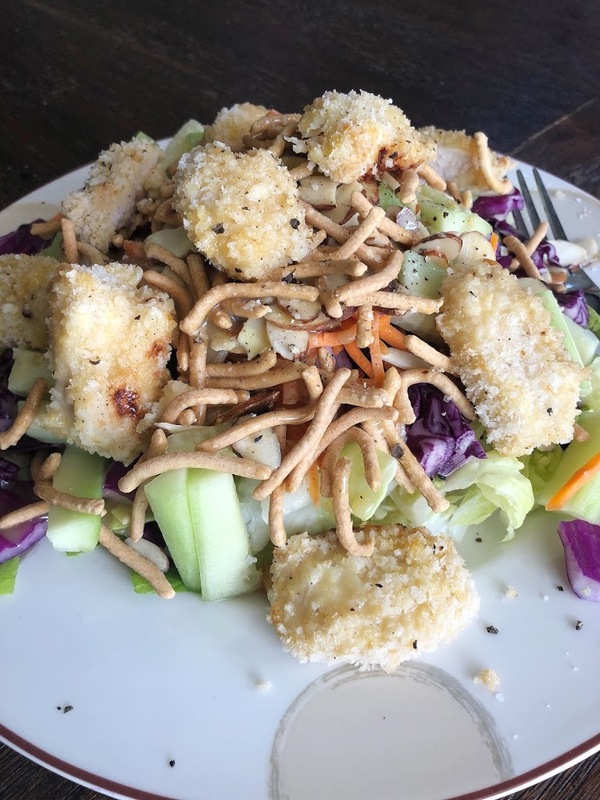 The key to the perfect Chinese chicken salad is the chicken having the right breading, the salad having enough crunch, and the perfect dressing! 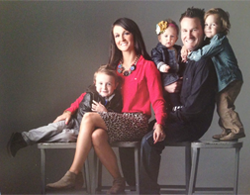 I love applebee’s…yes i know…some people (like my husband) aren’t fans. But man I love it. So one day I was wondering How do you make applebees oriental chicken salad. And that is when this copycat applebees recipe was born! I absolutely love this salad!! That is all I can say! It is in my top 3 favorite salads for sure! And better yet when I serve my husband this salad his eyes light up! It is absolutely his favorite! I have messed around with different toppings and dressings and this is how I like it! So here is the recipe! Use the chicken recipe from here. Make the chicken according to the recipe found here. Then set aside to cool. In a bowl mix up the dressing. If you are serving dinner size salads for more than 2 people I would double the recipe. 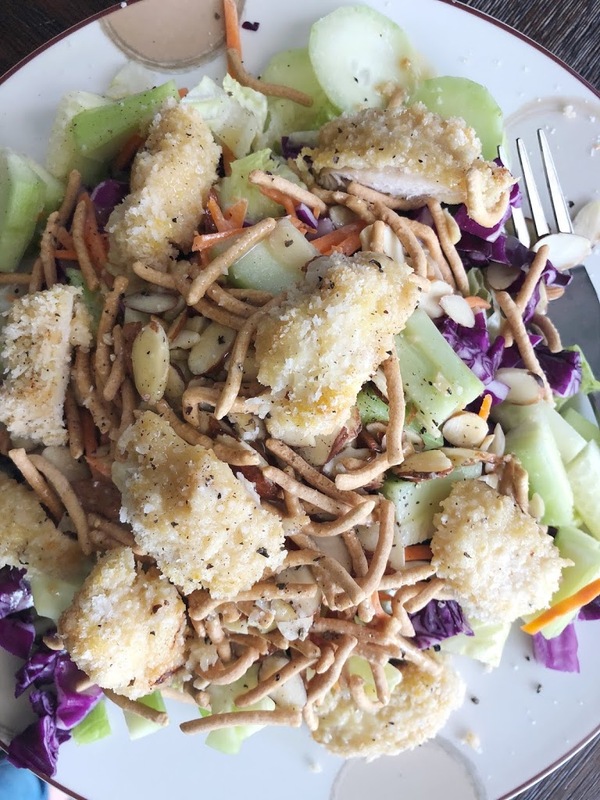 (I love dressing but if you don’t and like a drizzle then it should be plenty, but have more on hand just in case) Then prepare the salad by first putting in romaine, then the cabbage, then carrots, then cucumbers, then top with the chicken, then the noodles and almonds. Finish off with the dressing then serve! Preheat oven to 425 degrees. Then take the chicken and cut into 1 inch cubes. Then grab a brown paper sack (or ziplock) and toss the chicken in there. Then sprinkle with 1 cup flour. Give the chicken and flour a good shake until it is fully coated. In a bowl add the eggs and water and whisk. In a separate bowl add the Panko. Grab a cookie sheet and line with parchment paper. Then grab some tongs and grab a piece of the floured chicken and then dip in the eggs, and then in the panic. Make sure it is fully coated in all the ingredients. Then place the chicken on the cookie sheet. Line the chicken on the cookie sheet not touching. Complete the chicken until it is all used. Then top with salt and pepper. Place in the oven for 23-26 minutes. Or until the chicken is cooked until golden brown. And the chicken no longer sticks and it is all the way cooked. Make the chicken according to the recipe. Then set aside to cool. In a bowl mix up the dressing. If you are serving dinner size salads for more than 2 people I would double the recipe. (I love dressing but if you don't and like a drizzle then it should be plenty, but have more on hand just in case) Then prepare the salad by first putting in romaine, then the cabbage, then carrots, then cucumbers, then top with the chicken, then the noodles and almonds. Finish off with the dressing then serve!